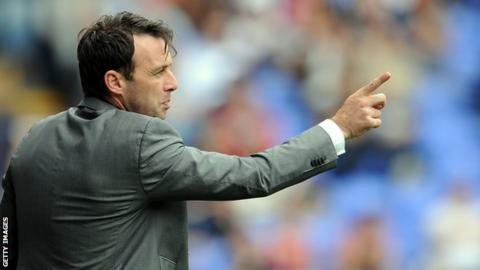 Bolton boss Dougie Freedman says his faith in his players was vindicated after their first win of the season. Joe Mason's second-half hat-trick helped the hosts overcome Rotherham United 3-2 on Tuesday and secure maximum points for the first time in seven matches dating back to April. "It is not a relief to see it - it just justifies my belief in the players," Freedman told BBC Radio Manchester. "I was never concerned over this difficult period." The 40-year-old continued: "I'm very proud of the players as everyone put their body on the line for the football club to make sure we got that win. "We got it right in terms of showing pride and passion first, and quality at the end to come through"
Freedman also heaped special praise on forwards Mason and Craig Davies. "The work-rate the two of them put in, unsettling the back four throughout the game, was key to us playing well," added Freedman. "I thought Craig Davies, the amount of things he did off the ball, was fantastic." While on-loan Cardiff City man Mason became the first Bolton player to score a treble since German Fredi Bobic in April 2002, the 23-year-old singled his strike partner out for his unrewarded efforts. Davies, 28, has scored five goals in 33 league appearances since arriving from Barnsley in January 2013. "I've scored the goals but I think Craig deserves an awful lot of credit because he has done just as much, if not more than me in that game," admitted Mason. "We are building something quite good at the minute, it is taking time but it will pay off in the end. "I was getting anxious as I hadn't scored in four games before this, so to get three is a relief and gives me massive confidence." Meanwhile, Bolton have confirmed that the contract of winger Yannick Bastos has been terminated by mutual consent. The Luxembourg international, 21, failed to make a first-team appearance for the Championship side after joining from FC Differdange in January.